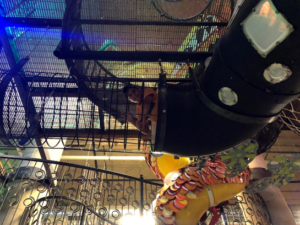 If you’ve ever been to the City Museum in St. Louis, you will recognize much of what’s going on at SPARK! in Dallas. It’s truly a wonder for the imagination, the mind and the body. It’s best not to have any expectations when visiting SPARK! Our family went on a Friday afternoon, which is rare because normal operating hours are weekends only. They’ve opened for special summer hours, so I think we just got lucky this week. It was not at all crowded, but a there were good number of people with whom to interact. Children of many ages and backgrounds were there exploring. 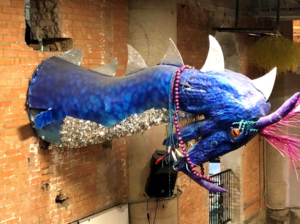 This attraction is located inside a large warehouse-style building that also houses a small market, coffee shop, high-end gym and apartment complex in an area of Dallas that hasn’t always been user-friendly. It is unexpected and delightful to find this gem in such an odd location. It seems that the entire area is experiencing a rebirth! It’s lovely. Upon entry, the visitor is greeted with a beautiful double-door painting resembling a human butterfly. When you walk in, you observe a small gift shop and check-in area, and then descend the stairs to a large workroom/makerspace. 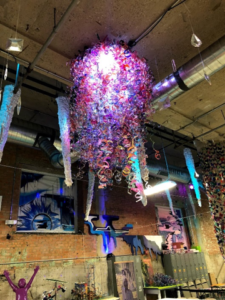 The ceiling is covered in collaborative pieces like mock-Chihuly sculptures, stalactites and butterflies galore. Interactive pieces move to lighting and music. A large stage at the back of the room indicates this area is used for large events, parties, classes and camps. What an amazing space! Off to the right is a section of ship, complete with portholes and a ladder that leads visitors up to the beginnings of the climbing area. This is no ordinary climbing structure, friends. 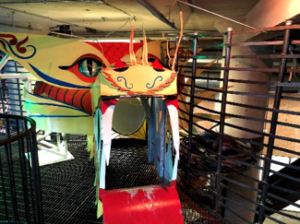 Hidden passages, slides, and dragons, cargo nets leading to tunnels, and a carwash-turnstile offer much to explore. This area is about 3 stories high, and there are two slides that spans that height. On the ground floor, there is a music area, giant light bright, photo booth, bouncy chairs, lion swing, hot air balloon ride simulator, spaceship cockpit and outer space simulator, a massive LEGO table, displays of whimsy, art, more dragons and butterflies, paper airplane sculptures and much more to attract one’s attention. After deciding our kids were okay exploring on their own, so long as they weren’t running (this was a no-no), we decided to hang back in the workroom/makerspace where both my husband and I were honed in on the activity of the day: stamping! You better believe we will have this in the Explorium maker space! It’s difficult to describe what all we did while there but suffice it to say that after two hours all three of my very active boys were pooped. 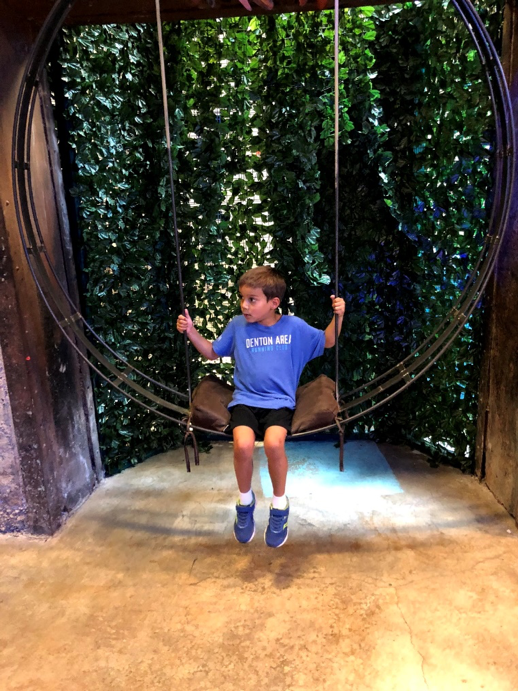 This attraction is great for families with children of all ages. I can even imagine a couple there on a date! Simple rules, sufficient supervision, and NO LIMITS on imagination, this place is totally worth the drive to Dallas. We left inspired and energized having spent a nice afternoon together as a family. To learn more about SPARK!, visit their website here. Until next time:, Engage. Explore. Educate.